In another Finding Bigfoot sneak peek video released by Animal Planet, see witnesses at the New York town hall meeting recount their tales of encountering sasquatches. 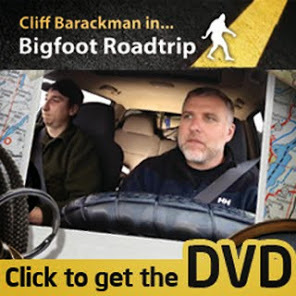 Watch the clip below, but be sure to catch the entire episode when it debuts on January 1st at 10 pm on Animal Planet. Following each episode in season 2, I'll be posting short essays detailing my personal commentaries on each episode. These will give insight on the encounters, investigations, and other bigfooty things that happened behind the scenes. Exciting! I am pump and ready for the next season of FB. I first of all would like to say that I as a decendant of Native american ancestry I believe in the giant man of the forest they call bigfoot. I have a different view though about the type of creature that the large majority say it could be. I truly think this is a lost ancestor of man. Neanderthal, perhaps, an ancestor to us. Their foot print, their prehistoric human type muscular body. This I believe and I believe this will be the case in the end. They are intelligent, and they are primitive and they do not want contact with man. So glad you got picked up for another season, Cliff. Always fun to watch! To elaborate more on my comment about perhaps being a primitive ancestor of modern man. I am intrigued by the fact that there could, and I myself, do believe there is more out there than what we now know of. I do believe to that if they were to be found or a group discovered they would be harassed and there way of life would be forever a thing of the past and a marvelous creature would be no more. Mixed feelings have been a thing that keeps me from hunting them as would a big game hunter would and the respect for what they MIGHT BE from the legends of my native american people allow me to wonder if they should be left to their own life as it is.